We believe that Maths should be both interesting and enjoyable. Students should be challenged and encouraged to fulfil their potential. 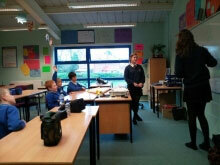 Upon entering the school in Year 7, students are set based on the score achieved in their KS2 test. The year groups are divided into two parallel bands of 4 sets. These sets remain flexible and are changed as a result of regular assessments of the students to ensure that all students are working at the correct level for their ability. Students continue in two parallel bands of 4 sets up to Year 11. All students follow the new Edexcel linear GCSE specification and sit their exam in the Summer of Year 11. 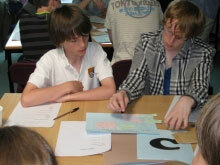 Students have the opportunity to study for certificates in Maths alongside their GCSE courses. Where appropriate, some students in set 4 will study for Edexcel’s Level 1 & 2 certificates in Number and Measures, which can be a useful aid to post-16 applications. The maths department offers a variety of enrichment opportunities which include UKMT individual and team challenges, TTRockstars events and visits to popular Maths lectures.